Three backers of Catalonia's independence have sought to secure release from jail for their role in the region's push to break from Spain which triggered the country's worst political crisis in decades. Former Catalan interior minister Joaquim Forn, Jordi Sanchez, a member of the pro-independence National Catalan Assembly civic group, and Catalan activist Jordi Cuixart made their case for release from provisional jail to a Supreme Court judge. A ruling from judge Pablo Llarena is not expected on Thursday. Mr Forn was one of several regional ministers jailed on provisional charges of rebellion after the Catalan parliament unilaterally - and unsuccessfully - declared the region's independence on October 27. The move prompted the Spanish government in Madrid to dissolve the regional parliament and call fresh elections that were held last month. Mr Sanchez and Mr Forn were elected on separatist party tickets in that ballot, which took place amid political turmoil in the wealthy north-eastern region of Spain. Mr Sanchez and Mr Cuixart had previously been jailed on provisional sedition charges related to preparations for an October 1 independence referendum in Catalonia which the Constitutional Court had said could not go ahead. Mr Sanchez acknowledged to the judge that the region's October 1 referendum on independence was not legally valid, according to lawyers. Developments surrounding Catalonia have gripped Spain for months and the tumult is showing no sign of letting up before the newly-elected Catalan parliament's first session next Wednesday. 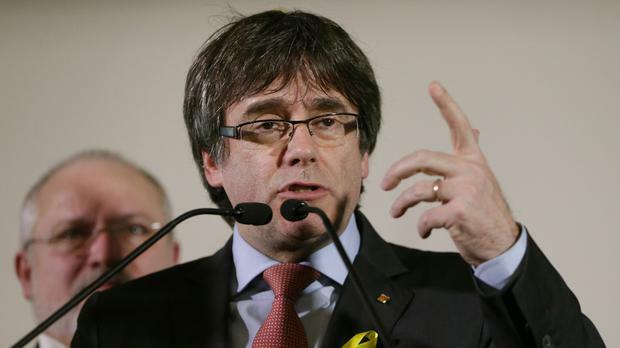 A major question mark hangs over whether Carles Puigdemont, who fled to Belgium to avoid arrest for his part in the secession bid, will return to Barcelona to take office as regional president - a post he held before the Spanish government fired him and his administration in October. He risks being detained if he comes back, as do four other ex-ministers who fled with him. Meanwhile, Carme Forcadell, a prominent pro-independence lawmaker re-elected last month, said on Thursday she will not seek re-election as the regional parliament's speaker when the chamber sits next week. Ms Forcadell, who is also under investigation for rebellion for her involvement in the push for independence, said it was time for someone else to occupy the post. The role is important because the speaker can decide what is debated and voted on.